Will Solar Storms be a Threat to Life? Solar Storms are coming. Emergency Survival knowledge, and Preparedness are key. You may be asking questions like, “Exactly what is a solar storm, and how can it affect me and my family?” “What emergency survival knowledge should I know about?” “If preparedness is the key, then what should I do?” In this four part document we are going to answer these questions and provide insight into the larger picture. We will give you the information that the media, and government are holding back. So what is a solar storm? 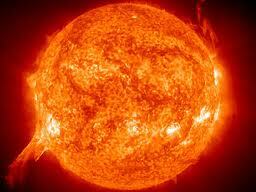 Well solar as you might have guessed refers to an event involving our sun. A storm is defined as a violent disturbance of the atmosphere. But instead of the disturbance occurring in the form of thunder, lightening, or precipitation, it is in the form of charged particles that are ejected from the sun. These charged particles travel in large clouds that can carry up to ten billion tons of plasma. These clouds are also called Coronal Mass Ejections (CMEs), when they are released from the sun. The particles in a CME (ions and electrons) are electrically charged, which means they also feel magnetic forces. Under normal circumstances these particles would be deflected by the Earth’s magnetic field or our shield if you will, and the survival of our way of life would not be in jeopardy. According to researches sponsored by NASA our magnetic field often develops two holes that allow huge leaks. These leaks can allow up to twenty times more particles to pass. You might be thinking that this sounds like a bit of an emergency. Hold on we’re not done yet. The number of particles breaching this shield depends on the orientation of the sun’s magnetic field. When the Sun’s and Earth’s magnetic fields are in alignment the largest breaches occur. The sun’s magnetic field changes direction every cycle. In the summer of 1859, on August 28th, the magnetic fields of the sun and earth were in such an alignment. Solar observers of the time noted the development of numerous sunspots on the sun’s surface. Sunspots are the originating point of CME’s. They are regions of extremely intense magnetic fields that are intertwined and can suddenly release energy in a violent solar flare. There was no anticipated doom or emergency on September 1st, 1859, when the sun released a mammoth solar flare. For nearly an entire minute the intensity of sunlight produced at the region of the flare actually doubled. The CME resulting from the solar flare itself contained an extremely intense magnetic field that was oppositely charged to that of Earth’s magnetic field. The result was the Earth’s magnetic field was overwhelmed allowing charged particles to penetrate into the upper atmosphere. There was very little need for solar storm preparedness in 1859. The only technology that was susceptible at that time was the Telegraph. The CME or Carrington Event, as it has come to be known, gave a jolt to some telegraph operators, and some of their offices even caught fire. So there was no emergency or threat to survival; life in 1859 pretty much went on as usual with the slight inconvenience of no telegraph messages for a while. Imagine our society today, and how dependant we are on electronics, and power transmission. How would we react if suddenly all of that was taken away by one of these CMEs? According to a report by the National Academy of sciences, if such a storm occurred today, we could experience widespread power blackouts with permanent damage to many key transformers. A CME could very well occur during the next solar maximum and could be more intense than what happened in 1859. Our very survival could be on the line. “When”, you ask, “is the next solar maximum?” We’ll talk about that and what preparedness steps you can take to ensure your survival in upcoming papers. So stay tuned. William Tonkin, took an interest in outdoor survival from a young age. He was involved with boy scouts, and worked his way through the ranks. The other boys looked up to him as a natural leader, with good knowledge and instincts about navigation and survival. Following high school William joined the military, and was stationed in Montana, where he learned a great deal about cold weather survival. In more recent years William worked with emergency services developing mapping and communications software for their vehicles. Now as an entrepreneur of an online emergency survival supplies business, he continues to expand his knowledge about survival and shares it with his customers. Find out more about disaster preparedness and how to protect your family http://www.packs4survival.com.